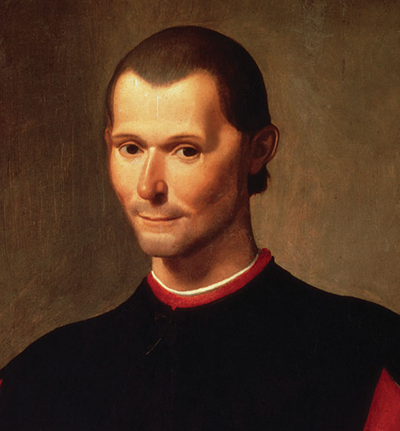 Niccolò Machiavelli, not looking at all Machiavellian, but more like somone who has just told an off-color joke. Attribution: Santi di Tito [Public domain], via Wikimedia Commons. I am a technical executive, not a scholar of Italian Renaissance literature or an historian. I had had read Machiavelli’s classic, The Prince, for a Political Science class and my coworkers complaints about politics struck me as odd, until I realized that they were attributing the office politics to the company; whereas, I was thinking of it as a normal part of the human condition. My own mentor put it best when he said: “If you have three guys doing dishes in the back of a restaurant, you have politics. It just doesn’t pay very well.” With that thought in mind, I reread The Prince, and now having some considerable experience with corporate politics and some experience with electoral politics, I was freshly amazed. It seemed to me that not only was Machiavelli’s understanding deep, but it was sufficiently old to put politics into perspective in exactly the way that my new managers needed. I formed the idea that the reason that The Prince, seemed so relevant was that Machiavelli was writing, not about republics, but about principalities, i.e. states governed by autocratic rulers, in the same way that corporations are directed. With that idea in mind, I took to handing out copies of Machiavelli’s little book, and saying, “Here, read this. It will not make the political part of your job any easier, but at least you will know that it was not invented here.” My colleagues found it helpful and as I learned more about Machiavelli and his time, I found that my growing knowledge of the horrors of autocratic rule in Renaissance Italy caused me to reassess the present in a way that made me positively light of heart. Since then Machiavelli’s ideas have become a hobby. In the process I have learned a good deal of background information that I wish I had had when I first read The Prince. My purpose here is simply to share that information with you in a way that is both accessible and attractive. I hope it leaves you too, light of heart.